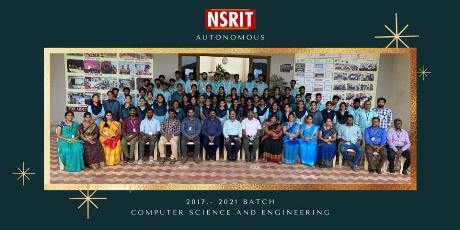 Recognized NSRIT as "A" Grade Institute by Govt of Andhra Pradesh. Received National Level Best CSI Student Branch award from Computer Society of India. Engaged with Top Industries Like TCS, Flipkart , Tech Mahindra for the curriculum enrichment. Modern Pedagogy for improving the Teaching-Learning Process like POGIL, Learning by doing, Show & Tell, Matrixing etc. PBL (Project Based Learning) for exemplary understanding. Conduct Career- Vision program to facilitate right career choice by students. A mentor is allotted for each 20 students to counsel the student in their academic as well as personal problems. NSRIT has a separate Communication & Soft Skills (CSS) department with professional trainers. Guest Lectures/Seminars by eminent persons. Personality development, motivation and training classes by experts. e-Learning mode of teaching is practiced in the campus. Workshops, Symposiums and Technical fest conducted by student’s technical associations like VECTA, SEA, ADVAYA, ACME & Robotic Club. Startup Bootcamp at NSRIT which would function as an idea Clinic mini incubator. Professional affiliations like IEEE, CSI, IE(I) etc…. State-of-art Labs as per domain requirements and emerging trends. 24x7 dispensary facility within campus. NSRIT has a strong Entrepreneurship Development Cell (EDC) to enhance Industry Relations & Placement Department and has been consistent in achieving 100% Placements for registered eligible students. A separate student welfare and guidance division headed by dean-student welfare. 35 Mbps hi-speed internet connectivity round the clock in the campus and in the hostels. Discipline is the hallmark with 100% ragging free environment. Innovative Clubs to encourage the student’s creativity like Technology forums & hobby clubs for students. Excellent facilities for all kinds of indoor & outdoor games & sports with coaches for all major games & sports. R&D Cell for exposing to latest developments and create spectrum of contemporary technologies to faculties and students.